Emily Bielecki, a Ph.D. Candidate in International Nutrition at Cornell University with Dr. Shambhavi Singh, Community Empowerment Lab (CEL) Project Director, and Dr. Swati Dixit, Post Doctoral Fellow at CEL share their experiences with anthropometry training and standardization at their field site in Shivgarh, Uttar Pradesh, where they are studying how agricultural seasonality and the various factors that are affected by seasonality (i.e. maternal work patterns, infant feeding, food security etc.) affect infant growth outcomes. We are excited to report that we have now officially completed 4 months of data collection in the Sow and Grow Study. As we reflected on our experiences for this blog post, we realized how many interesting and relevant interdisciplinary challenges have emerged along the way. However, as we have just completed our first round of anthropometry re- training and standardization for our 6 enumerators (3 teams of 2 enumerators work in 9 villages), the experience of conducting these trainings in community settings was particularly fresh on our minds. The basic goal of anthropometry standardization in a child growth study is to ensure that your enumerators can measure infant growth with sufficient accuracy and precision. This process needs to be repeated on regular intervals to help maintain quality over the course of a long study. The World Health Organization through the Multicenter Growth Reference Study (MGRS) has published excellent technical documentation in this area, and I would highly recommend this to anyone considering collecting child growth measures as part of their study. But we can’t do it like the WHO! In brief, standardization training requires a “Gold Standard” measure and duplicate measures by each trainee on a group of 10-15 infants in the relevant age range. Throw in the crying and agitation that measuring an infant can induce and one can imagine that this is quite a task! We quickly realized that, in contrast to the few training and standardization sessions that have been described in the literature, 1. We did not have access to a health facility or other clinical setting to facilitate access to the population group we were interested in measuring and 2. Due to logistical reasons, we did not have the ability to hire more measurers than we needed and maintain only those that possessed more natural measuring ability (For those of you who doubt, there IS such a thing as natural measuring ability!). What these two seemingly minor deviations meant is that 1. 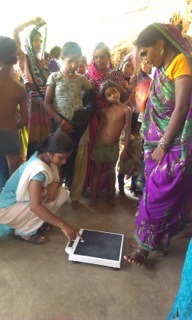 To conduct our standardization sessions we had to identify infants and collect measures directly in the Shivgarh villages, and 2. At the onset of our study, we had to invest significantly more time to ensure that all of our enumerators could measure with acceptably low levels of error. Who can we measure (multiple times)?! It was only through the excellent community networks and pregnancy surveillance system maintained by CEL that we managed to identify and obtain consent from women in the community to allow us to measure their infants (multiple times!). The first time we conducted this task, we had not yet figured out the most efficient approach, and the process of infant identification took several weeks! 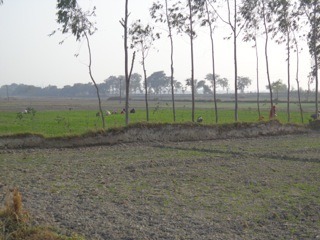 On top of this, moving from place to place in the villages (and finding a flat surface!) slowed the training down to a painfully slow pace. To complicate matters more, in not one, but in ALL 6 cases, the enumerators needed at least two sessions each (and additional office training in between) in order to reduce their measurement errors to acceptable levels. In total, close to 100 mothers and infants 0-12 months of age were measured for the first round of training and standardization! Such fatigue followed these long days in the field that we doubted the ability to repeat these sessions at regular intervals throughout the data collection! 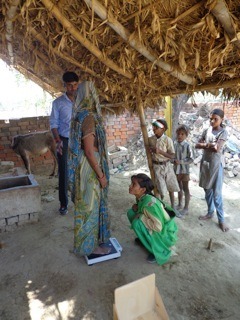 Photo: A study enumerator takes a weight measurement on an uneven surface in a village home. Spirit levels were used to identify a sufficiently flat area to place the scale. If at first you don’t succeed… re-invent and try again! We are happy to report that the struggle of our early training sessions truly paid off! In our most recent round of re-standardizations, enumerators were able to identify infants in days, rather than weeks, and just a few of the enumerators required any repeat training (approximately half as many mothers/infants were required for the repeat training). We also discovered more efficient systems that allowed us to complete the trainings in a more reasonable period of time. For example, we approached women in advance to obtain consent and make an appointment for measurement, invited several women to a fixed location in each village, and improved our interactions with the mothers/infants to make the sessions feel less burdensome for the participants. After rolling out and modifying this process for the second time at our field site, it has become clear that anthropometry standardizations can be done quite successfully in village settings. However, increased documentation and awareness of the process for researchers to understand the time investments, as well as the substantial modifications that may be required, would be tremendously useful to those planning and implementing interdisciplinary research with a nutrition/child growth component. Photo: A group of mothers and infants gathered in the community for a training and standardization session.